"That's what I'm talking about - you're Birdman!" Fox Searchlight has unveiled an extended (nearly 3 minutes long!) new trailer for Alejandro González Iñárritu's Birdman, which will be getting a centerpiece unveiling at the Venice, Telluride and New York Film Festivals. Michael Keaton stars as washed up actor Riggan Thomson, who once played the character Birdman, struggling to figure out meaning to his life when he decides to put on one last show. Emma Stone, Edward Norton, Naomi Watts, Amy Ryan and Zach Galifianakis all co-star with Keaton. This trailer is more straightforward than the last one, telling more of Birdman's actual story, but I still love all the music, I love the humor, I really can't wait to see this. Birdman or The Unexpected Virtue of Ignorance is directed by Alejandro González Iñárritu, who co-wrote the script with Nicolás Giacobone & Armando Bo (Biutiful) and newcomer Alexander Dinelaris. The film tells the story of an actor (Michael Keaton), famous for portraying an iconic superhero, as he struggles to mount a Broadway play. In the days leading up to opening night, he battles his ego and attempts to recover his family, his career, and himself. Also starring Zach Galifianakis, Edward Norton, Andrea Riseborough, Amy Ryan, Emma Stone, Naomi Watts. Fox Searchlight releases the film limited on October 17th this fall. 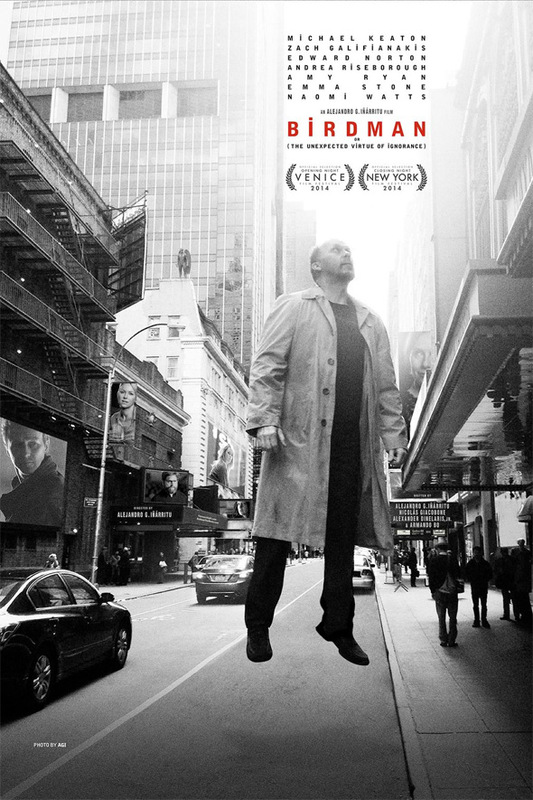 Here's the latest Birdman poster to go along with this new international trailer, debuted by Fox Searchlight. I'm on "Anyone but CumberHyped FTW" train but Keaton does look fantastic. Showy as hell performance. The cast is also top of the game. Crazy movie. Looks great. Keaton is fantastic. Galifianakis looks a little more serious than usual. Love the look of this! And Emma Stone is so damn versatile! If it werent for those giant eyes of hers I wouldnt have known it was Emma Stone! Yes this film stars Michael Keaton in the lead, also starring "in alphabetical order" Zach Galifianakis, Edward Norton, Andrea Riseborough, Amy Ryan, Emma Stone, Naomi Watts. Emma Stone is NOT the lead of the "also starring" cast nor is she the co-lead that most media is so excited about and endeavoring to hype. If only Norton had played his cards right, he could have been in The Avengers. I tend to prefer Ruffalo's approach...but the consistency of having the same actor play the character across multiple films would have been nice. I love Keaton but kinda disappointed. I thought it would be an actual Birdman movie or something. Love those old cartoons. Biiiiiiirdman! lol. Passing on the trailer. I am so ready for this movie. I'm really hoping this is the film that gets Keaton an Oscar nomination. Too early to tell, obviously, but I see some potential in that trailer. when's the wide release in USA??? ?